Trainee employee termination means to expel someone from the job because of bad performance during his job time. It is quite minded derailing decision to terminate the trainee without any due cause. When you have an authentic reason for terminating the trainee employee due to his bad performance then you do not let your institute or company go back in the darkness rather you terminate a trainee and give termination letter to the trainee employee due to his bad performance. What you mention in the termination letter that becomes quite reasonable and valid. In the letter, it is the most effective way to communicate directly with the trainee employee, whom you are giving a termination letter due to bad performance in his/her work. This is a job to do so but after all, there are few ways of terminating a trainee employ due to bad performance. For example, in the termination letter, you first regret when you are terminating someone. 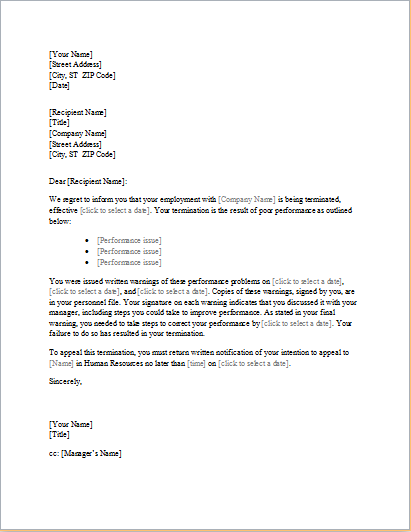 As you say in the letter on the behalf of your organization that we are sorry to let you know or inform you about your termination because of your bad performance and repeated complaints against you, such as very poor performance in the work and the work is not up to the mark or it is not up to the demand of the company. The second reason that you mentions is that abandonment from the job and long breaks during jobs and also sudden breaks during duty timing. You also mention the reason that you gossip more in the office during office time. First and foremost and last reason you mention is that the misconduct of the trainee during working time or hours. And lastly, you mention the using of the abusive language of an employee with the office staff. All above-listed complaints have compelled the management for your termination as you have been warned many a time earlier and your verbal assurance that you will rectify your mistakes but you did not follow that. So, that you are hereby terminated from the job and the human resource team will have inquiry against you and if you have any objection, then you may contact the respective department. You are terminated from the job dated 31/1/2016, you are asked to leave immediately.